Informed consent is the process of informing a client, patient, or research subject of the risks, benefits, expected outcome of a research project, medication, medical procedure, or therapeutic approach in which they have agreed to take part. State laws on informed consent vary, and many states set out specific elements that informed consent forms must contain. 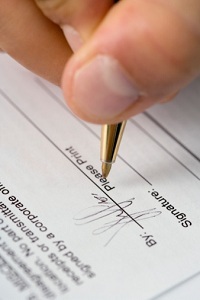 Doctors and mental health professionals frequently give their clients informed consent forms to sign before beginning treatment or altering a treatment plan. A possible source for State Department of Health can answer questions regarding informed consent requirements for different types of providers, including therapists. Because clients are paying for or seeking out medical treatment, they have a right to direct the course of that treatment and to be aware of its limitations. However, there is significant debate among philosophers, clinicians, and laypersons about what constitutes sufficiently informed consent and how best to provide clients with information necessary to make treatment decisions. Different clients have different competence levels. The words used in medical or therapy treatment may be unfamiliar to some clients, limiting their ability to make good judgments about their treatment. Clients experiencing dementia, delusions, and other conditions that interfere with their decision-making ability may not be able to give consent that is fully informed. In some cases, these clients may not consent to treatment at all and instead a guardian may authorize treatment for them. Clients being held in mental institutions and in correctional facilities may not consent to their treatment. In some cases, particularly if the treatment is necessary to ensure the safety of the client or others around them, treatment may continue even without the client’s consent. Most states require that clients still be informed about their treatment, even if they do not consent. It is nearly impossible to provide full information to clients, and the information clinicians provide is almost by definition selective and incomplete. For example, clients are unlikely to learn of every side effect that anyone who has ever taken a drug has experienced. Their clinicians may or may not inform them of alternative treatments, particularly homeopathic remedies. In many cases, it is impossible to predict the outcome of treatment. For example, antidepressants are extremely effective for some people, while in others they might result in suicidal ideation or other serious side effects. Thus information necessary to consent is given based on statistics and research, but does not necessarily tell the client what will happen to him or her. Minors cannot typically give informed consent and a parent or guardian must be involved in treatment selection. A person seeking treatment for depression might elect to take selective serotonin reuptake inhibitors. His/her prescribing psychiatrist would then be required to tell him/her of the potential risks of these medications as well as their possible benefits. However, because research differs slightly, clinicians might have different opinions on the risks of certain treatments. One clinician, for example, might view the risk of sexual side effects as the most significant risk, while another might believe that the most likely side effects were nausea, dizziness, or suicidal ideation. Thus informed consent has a subjective element that is partially influenced by the client’s questions, the provider’s research and access to information, and the time the provider has available to spend with the client. Berg, J. W., & Appelbaum, P. S. (2001). Informed consent: Legal theory and clinical practice. Oxford: Oxford University Press. Have read the informed consent and at least have learned something.kindly assist me know how i can go about the same when i am working out an issue with a client who has been on hard drugs for long.I had been with him at Mathari mental hospital for 4 months now.At times he get lapses due to drug exposure. Am glad to have you in the net.At least have learned something.Thank you. Does a therapist need to see a divorce settlement when one of the parents want therapy for the children ? Needing to see the divorce/custody orders before treating youth will depend on the state you practice in, but it is a good practice to do so. Some parents will represent that they have full legal custody (being the sole individual responsible for medical, educational, legal, health, etc. decisions) of their child(ren) when in fact they have full physical custody yet share legal custody. It can be challenging when one parent wants services and the other doesn’t, but it is a good practice to protect yourself to get consent from all guardians. Hi am glad and sincerely pleased to read from you.Actually it is of great help.Some how i was in that direction,though i was in dilemma how do i do it.Thanks that your information is relating with what i thought earlier on before i emailed you.Although your response has given me another highlight on what i was not well informed about.This issue of different ways of handling clients with different matters. Is Client/Patient informed if they ask what information was shared with other Psychologist?